Coffee or Dark Colored Drink Spills on an Oriental, Persian or any type of area rug can be difficult to clean up. Most rugs are made from natural fibers like wool, silk, jute or sisal. These natural fibers readily accept color and incorporated them into the rug colors. Red sports drinks, coffee, cola or even iced tea, can add their colors right on top of the current dyes! These fibers can take on the color of the spilled drink, so act quickly. Immediately blot up the liquid by putting a folded bath towel under the rug and a folded towel on the top of the spill then stand on the towel to press out as much liquid as possible. Add fresh water from a spray bottle to the area and continue using clean towels to draw out the drink spill until the area looks clear. Change towels as needed until they remove the liquid. Dry the area quickly with a fan or by lifting the rug to get air movement. Always blot when cleaning natural fibers because rubbing the spill area will cause fuzzing of the fiber. The result: these natural fibers then have a different surface texture which will show even after the spill is removed! Red wine, strong coffee, red sports drinks are challenging stains in your rugs. Adding “Oxy” cleaners or wall to wall carpet cleaners to natural fibers can fade dye colors or cause the colors to “bleed” into adjacent colors. It is best to avoid these cleaners which can cause additional issues on your area rugs. 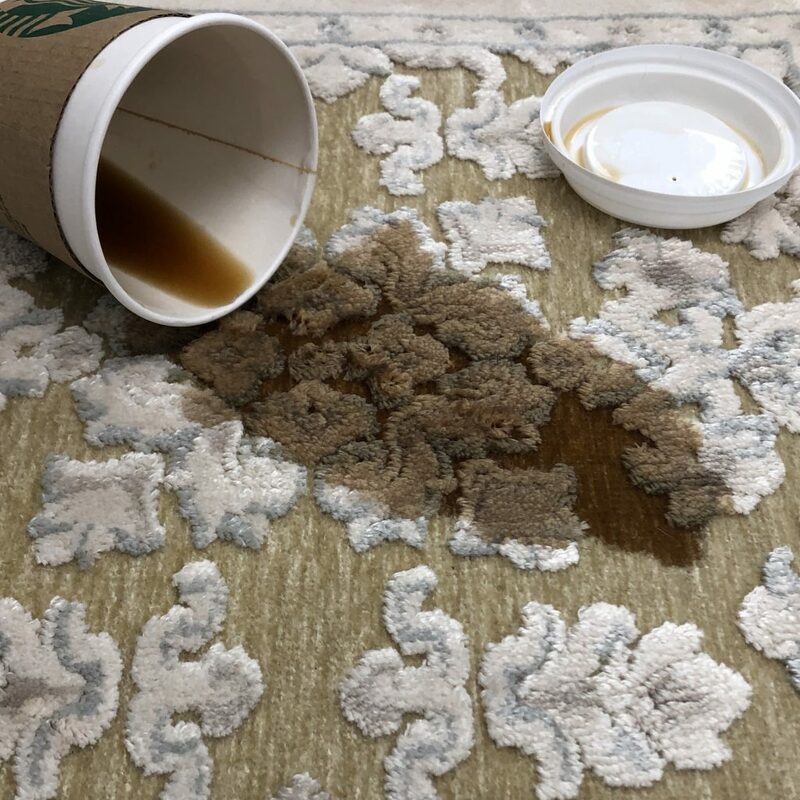 For additional help to remove coffee or dark colored drink spills, consult a professional area rug cleaner. They have experience in handling the tough problems in all types of area rugs. With your questions on spills you can contact Cristomar by using the “Contact Us” Tab and scroll down to “Drop Us a Note”; or call: 770-753-4242. You may also be interested in reading our “Post” – “Spills on Your Rug“.